A wild take on something like The Talented Mr. Ripley where a character will do anything and cross anyone in order to get ahead, without letting any moral questions stand in his way. 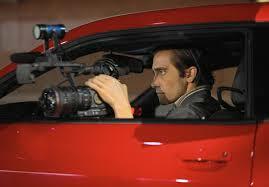 Nightcrawler is a pretty awesome movie. It is dark as hell, letting us know our main character, Lou Bloom, is a bad seed, right from the start. He breaks into a scrap yard, steals some metal, and then attacks the security guard and steals his watch. Bloom is a guy looking for a job. He finds his opportunity in the business of filming car accidents and crime and then selling the footage to local television news networks. The first half of the movie is about watching Bloom hone his craft, make connections, and build himself up in the industry. The second half takes it to the next level. That’s where Bloom’s success goes to his head and he crosses over lines that show he has absolutely no boundaries. When this movie, (which has been about all different stories that Bloom captures,) suddenly becomes about a single story for the final act of the film, it achieves a level of excellence that was completely unexpected. This is a movie that really does get better and better as it goes on, building in both tension and also raw evil manipulation. Not exactly a feel good movie, but man is this one gritty and intense! Nightcrawler is a fantastic movie. It’s one of those films like Network or The Talented Mr. Ripley, where the main character is pretty much pure evil and will do whatever it takes to get ahead, without letting any moral obstacles stand in his way. This character is Lou Bloom, played by Jake Gyllenhaal, and he is fantastically menacing. Gyllenhaal plays him perfectly, often giving us two different personas. The first is the one that is fake and kind and super-knowledgable and exciting. That’s the one where he’s a real go-getter and fast talker. The other one, which is the real one, is where he is no longer putting on a face and instead telling it like it is no matter how brutal and unexpected the truth might actually be. At the start of the movie, Bloom is breaking into scrap metal yard, cutting through the fence, and then sneaking in. He’s stealing a bunch of metal to take it somewhere to sell, and when he is confronted by a security guard, Bloom talks a big game about how he didn’t know he couldn’t be there. Even though everything he says is ridiculous, such as that there were no signs which said private property (when really they are all over the place,) Bloom still sounds convincing. And when he gets in close enough and notices a watch on the security guard’s wrist that he likes, Bloom attacks the man, punching him out and then stealing the watch. This is our introduction to the character. It’s unclear what exactly Bloom wants to do with his life or how he ended up here. Does he have a family? What was he doing with himself before this? None of these questions get answered and that is an intentional strategy which makes us all the more curious. Just like Tom Ripley, all we really know about this character is what we see of him when the film starts. He’s a man in need of a job who is willing to do anything in order to get what he wants. When he sees a car accident on the side of the road, Blooms stops and jumps out. He walks over to the accident where paramedics are pulling people out of the cars, and Bloom sees cameramen videoing the whole thing. He sees one man in particular, Joe Loder (Bill Paxton) getting in there and being aggressive. Bloom follows Joe to his vehicle and starts asking him questions like what does he do with the footage he shot. He even asks Joe if he is hiring. And he is rejected once again, Bloom decides he’s got to do this on his own. That starts with getting the equipment he will need. He steals a bike and then trades it in for a police scanner and a camera. Bloom continues his big talk with the bike exchange, giving the store owner a whole story about the bike and going into detail about every one of the bike’s features. We know, of course, the Bloom just grabbed this bike up, and is improvising right there in the moment, and boy does he do it well. Once he sells off the bike, Bloom uses the money he gets for the equipment he needs and gets to work. He uses the police radio to find accidents, gets to them fast, films what he can, and then sells the footage to a local TV news station. At the news station, Bloom meets Nina Romina (Rene Russo) a producer responsible for giving the anchors the stories they will be running based on the footage that has come in. Nina is taken with Bloom and wonders how he was able to get the things that he brings in. She tells him that there is potential for him to get paid more if he keeps brining them more things. Bloom is infatuated with this world. For the first time he feels welcomed in to a higher level of society. He starts noticing things like the colors of people’s ties and when they were certain outfits. Then he goes and hires a kid who has been living on the streets to be his assistant. Blooms realizes that he’s going to need help and this kid, Rick, will work for the cheapest amount possible. Bloom tries to pay him nothing, and convince the guy to be his intern, but they end up settling on thirty dollars a night. Things move to the next level when Bloom starts getting even better at his job and beating the police to accident scenes. When he gets to one of them out in the hills, way ahead of the police and EMTs, Bloom decides to manipulate the scene in order to get the best footage. He tries filming from far away and walking forward to reveal the body. Then he drags the body of the victim into the light where his footage will come out better. This is where Bloom starts crossing a new line. Joe Loder arrives at the scene and is impressed with how quickly Bloom got there. He now offers Bloom the job he wanted, even upping to the point of being partners and getting his own van, only Bloom turns him down. This is Bloom taking things to a level that is so far above where he started. Especially when he goes in to meet with Nina and ends up blackmailing her into having a sexual relationship with him. He tells her that he knows about the ratings game and how she is at the time in her career where her contract with this network is nearly up, to the point where the footage she brings in this month means the difference of whether she will stay or go. He has the power to help or hurt her career. And then something happens that is completely unexpected. The movie is pretty good as it is, taking this character to higher and higher levels of evil and corruption. Then all of a sudden it becomes great. Instead of continuing to give us all different events that he films, the movie starts to narrow its focus and suddenly become about just one. A new story pops up in the final act of the movie and ends up serving as an incredible turn and climax. Bloom arrives at the scene of a murder way before the police, while the killers are still there. He not only films the victims after the killers have driven off, but also gets footage of the actual murderers and then uses it to take his aspirations even further. This guy sits on the identities of the killers in order to use it exactly how it will benefit him the most. The things that happen in the final segments of this film are incredible. Most movies that start out pretty good end up going downhill in the second half. That’s because they often can’t maintain the world and enthusiasm they have created, or they simply run out of ideas and end up falling into the usual cliched traps, over time. 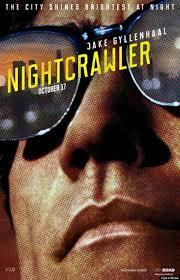 Nightcrawler is a rare exception. It is a movie that actually gets better and more intense as it goes on, just the way great movies are supposed to. This is a fantastic film.